My boss hates Jane Eyre. So she gave me her tickets to the MTC play last night. We decided to check out Shawarama Khan for supper int he exchange. It was super good and just a tad garlicky..... as in I don't have to worry about vampires ever again garlicky. I got the the chicken plate and it was enormous, comes with all sorts of good stuff, humus, this sour cream garlic topping, two salads, rice and potatoes. It was also really great to see a restaurant in the exchange so busy. The place was nearly packed. Very cool. Ah yes, back to Jane Eyre. Now, my understanding of Charlotte Bronte is admittedly limited. But as I see it, this is the basic synopsis. 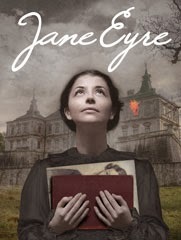 Jane is introduced lo the audience living with her aunt, who dislikes her and she is subject to cruelty at the hands of her cousins. She is then shipped off to an school institution where conditions are not much better. She befriends a young girl Helen, who soon succumbs to consumption I believe. Ah yes... start with the tragic....right in the feels. On a related note, what the hell is consumption? The epidemic of Typhoid or some related type illness means that the head of the school is forced to leave and conditions improve thereafter. Jane stays on as then becomes a teacher. Soon she takes the position of governess of a girl named Adele at some mansion. Jane falls in love with the girls father Mr. Rochester. This is where things got a little fuzzy. There is a lunatic living at the mansion, but initially we don't really find out who/why or even if she is living and not a ghost. As Jane and Mr. Rochester plan their marriage it is intervened by a man stating that the marriage cannot happen because Mr. Rochester is already married. DUN DUN DUN. To the lunatic as it turns out. So Jane flees. Find out the guy you want to marry is already married to a lunatic who tried to burn down the house, running away is fairly justified. So Jane is now penniless, taken in my a nice family. She is contacted by her evil aunt who makes amends and then soon finds out that her uncle left her money. She also finds out that the nice family is actually her three cousins, how's that for a coincidence? She goes back to see Mr. Rochester only to find out that his lunatic wife, burned down the house and flung herself off the balcony to her death. In trying to save everyone Mr.Rochester lost an arm and is now blind. Jane marries him and in the end scene she states that they have been happily married with a child for the past ten years. The thing is, reading that you get the impression the play was kind of a tragic downer a little bit right? I mean it all kind of sorts itself out in the end, but not an overly fluffy bunny kind of story if you know what I mean. But the adaptation of the play was interesting in that they added comedic elements to it. Also, there was MINIMAL sets. For example when Jane takes a carriage to go to her new school, the "Carriage" is a guy with two chairs. When the "Carriage" starts to move, the driver and Jane pick up the chairs and trot around the stage for a minute and then set them down to signify that they have arrived at their destination. There was some random singing too. The actors sounded good, but clearly singing wasn't their thing. I am still sort of unclear whether it was truly necessary for the play. I think it likely could have been left out. Also, characters narrated their own scenes. For instance, when Mr. Rochester is sitting in a chair, the actor would say something like "Mr. Rochester is sitting in a chair with a rather gruff look on his face". So it was either the characters themselves or Jane narrating everything in between and among dialogue. Heather and I were a little confused at that. It definitely does take a little getting used to. The other interesting thing is that outside of the character of Jane, actors played multiple roles. So the girl who played the evil cousin, also played Jane's friend Helen, the surly housemaid at Mr. Rochester's house, the pretentious rich girl courting Mr. Rochester and the lunatic wife. They had guys dressing up at girls, girls dressing up as guys.... added to the comedy a bit. So while it was NOTHING like I expected, I still rather enjoyed it.